The contractor experienced difficulty in laying out the works and the contract administrator was required to provide assistance. The best approach may be to provide an allowance in the contract administration budget to complete the layout prior to contractor beginning work. This will ensure that the layout is completed as per the design and will allow sufficient lead time for survey staff to schedule the site work. Due to a high point of bedrock beneath the upper dam (area not available for initial site survey) the initial curve in the new alignment was partially submerged. In order to prevent any erosion in this area, the contractor placed additional spawning gravel in this area (as directed by GLES). Lloyd & Sons Trucking Ltd. was tendered out to supply rock boulders, geotextile Coir mat, root wads, Right-of-Way Seed Mix etc. They began work at the site on August 8, 2008 and the final inspections occurred on Sept 15, 2008. The objective of this project was to decommission an old dam, allowing the creek to re-establish itself to its natural path and enhancing the creek by stabilizing banks, improving the fish habitat features and planting native vegetation. The creation of this dam has for nearly 100 years halted the migration of native and naturalized salmonid species. 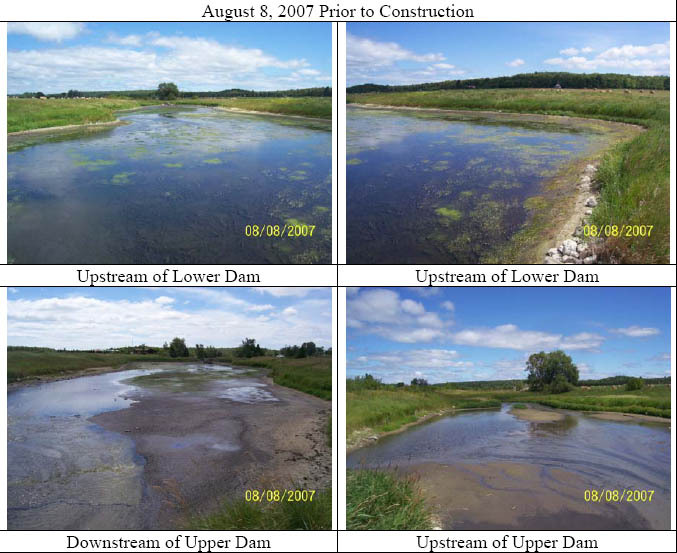 The dam has also caused water temperatures in the head pond to increase to a point where the outflow of these warmed waters have negatively impacted the aquatic environment for cold water species downstream of the dam. 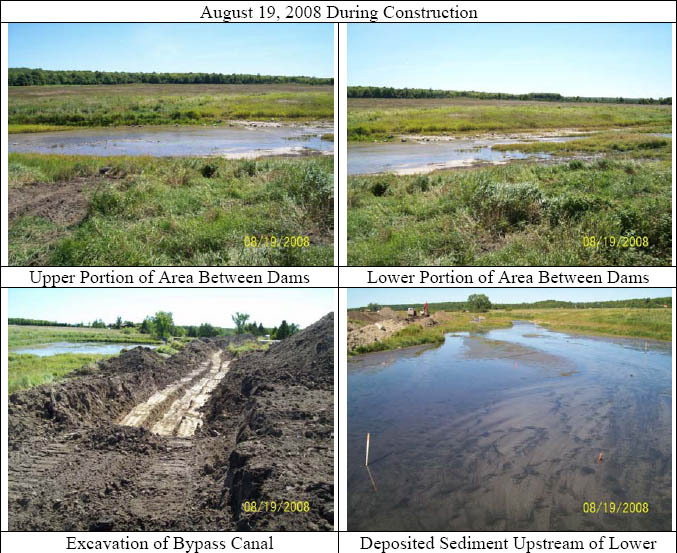 A detailed survey, engineering and hydrologic design was carried out in 2007 by the Great Lakes Environmental Services Ltd. for the “Manitoulin Streams” Association. 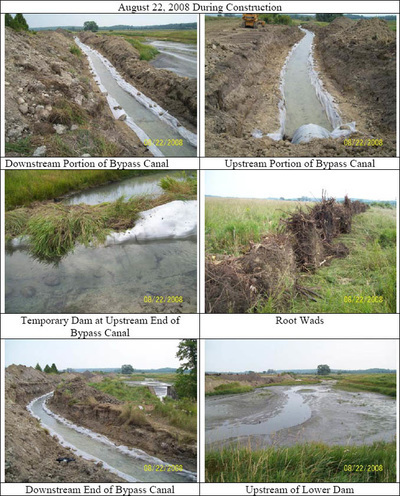 This design includes stream fish habitat and the final stream configuration (bank full width and depth, floodplain width and depth, sinuosity, entrenchment ratio, width to depth ratio). 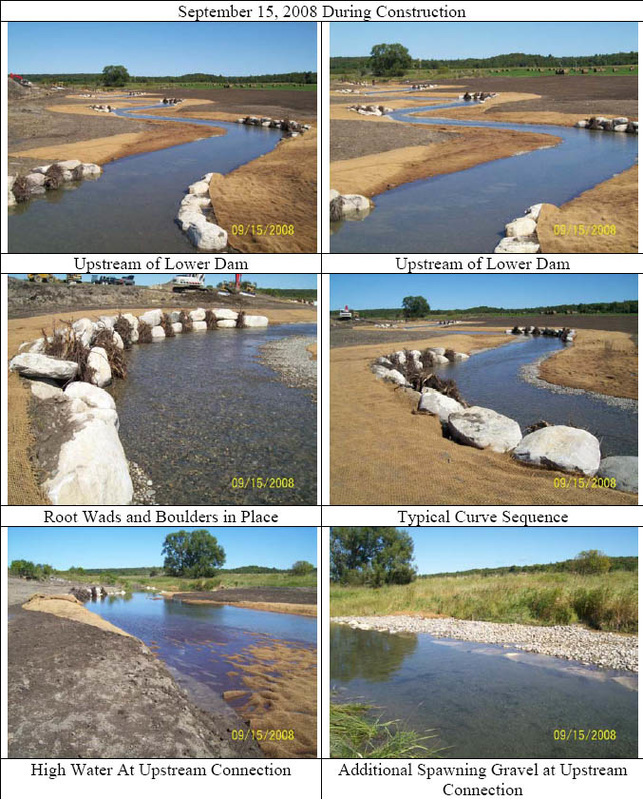 The undertaking involved purchasing fish habitat features boulders, root wads, geotextile-Coir Mat, erosion blanket and installing them along the newly constructed banks to enhance spawning and productivity of native brook trout and other salmonids species. The rehabilitation of site B-52 involved the installation of the following fish habitat works along an approximately 230m long section of Blue Jay Creek through an existing pond, removal and disposal of one (1) concrete dam structure (upper dam), creation of a new channel and floodplain through the entire creek length, installation of nine (9) sets of nine (9) root wads each along each corner of the new channel, seeding, general bank grading and the implementation of an Erosion and Sediment Control Plan. Stage 2 of this multi-phase project will include planting vegetation along both sides of the 230m stretch in the spring of 2009 to increase the survival rates of trees. Another CFWIP proposal was submitted in 2009 to involve our partner groups (LMAA, Stewardship Rangers, Nature Club etc.) to participate in further tree planting. 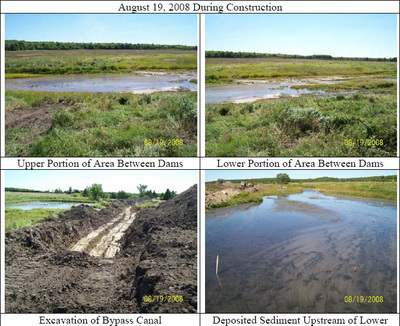 The work was completed according to the site plans through the cooperation of landowners, consulting expertise of Great Lakes Environmental Services (GLES) and equipment, material, and services of Lloyd & Sons Trucking Ltd. Funds from various sources were used to complete this project. 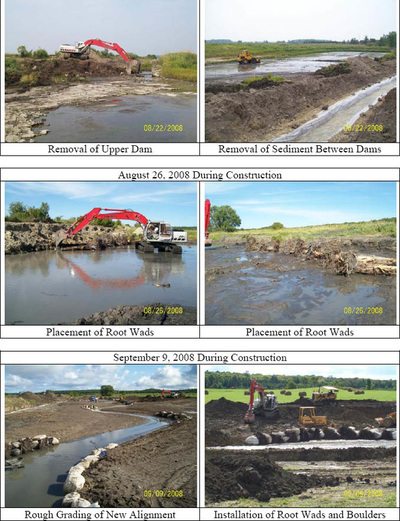 DFO contributed toward site surveying in 2007 and COA contributed toward site design in 2007. Heavy equipment rental and material costs were separated into various partners as follows; CFWIP, COA, and NOHFC. COA and NOHFC contributed for Site Supervision by a certified engineer. Manitoulin Streams had numerous meetings and email communications to discuss the details about this project including sending out Site Design Request for Proposals, Tenders and Site Supervision to ensure proper delivery of site design and issuing a winner of the bids. A total of 193 volunteered hours was dedicated by 61 “Manitoulin Streams” committee members attending meetings to discuss planning procedures. In-kind support from the landowner included backfill topsoil for the project, cash contribution and 60 hrs of volunteer time. This project had a total of 63 volunteers for a total of 253 hours working on this project at various times.